Lucy Yang reports from Midtown. EAST SIDE (WABC) -- After his two days in Washington, D.C., Pope Francis will fly to New York City on Thursday evening, and extra security measures are already going into effect. The amount of security for the pope's visit is unprecedented. Never before has the city rolled out so much manpower for one humble man preaching peace. "Let's keep in mind we have 170 heads of state, many are controversial in their own right. We're providing security details for each and every one of them. So we have to be mindful at the same time as we're dealing with the Pope," Police Commissioner William Bratton said. N.J. Burkett reports from the Upper West Side. On Wednesday morning, Bratton checked out the security preparations at St. Patrick's Cathedral, where the pope will say evening vespers Thursday. In Central Park, where Pope Francis is scheduled to pass through on Friday in his Pope Mobile, barricades are already up. The Secret Service and police walked through his processional route Tuesday to make sure they have enough layers of protection. "In addition to the specialized fence that the Secret Service is requiring, you'll see the traditional fencing that you see at all of our parades. Almost 39 miles of barriers, traditional barriers that'll be constantly moving to fence off a lot of these events," Bratton said. Cars on the upper West Side have already been towed and streets cleared. At the Army terminal in Brooklyn, more than 1000 police cars stand ready to be deployed. 600 officers will be on duty during his visit. 818 tons of concrete barriers have been delivered and will eventually be used to block off streets. 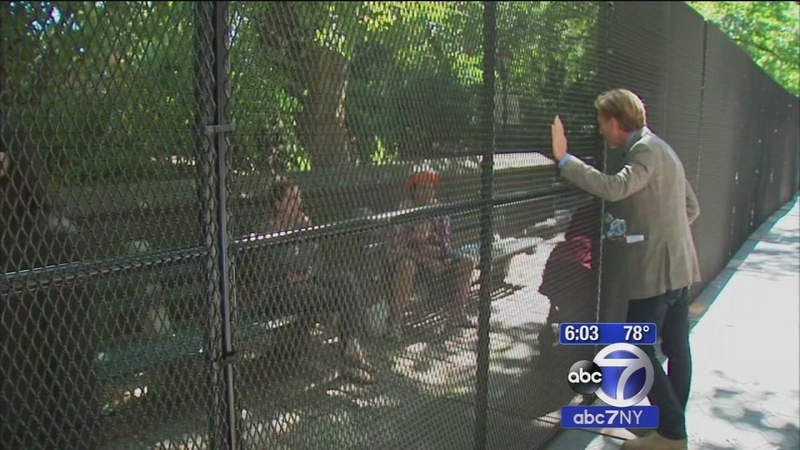 At St. Patrick's Cathedral Eyewitness News is told the 8-foot fence is an effort to help commuters get to work while thousands more wait out here for their beloved Pontiff. "It's annoying without the barricade; it'll be triple annoying with the barricade," a commuter said. "I'm anticipating the worst, hopefully won't be as bad as everyone says it will. We'll see," another commuter said. On Tuesday morning, NYPD Commissioner William Bratton expressed relief that the pope's 40-hour visit takes place mostly in controlled settings. "All of our events in New York are ticketed events, so we have the ability to screen everyone coming in," he said. "That's a big help to us." Meanwhile, the NYPD and police in Philadelphia and D.C. have issued a Joint Intelligence Bulletin that concludes there is no specific threat against the pope. It states that while he will be well-protected, large crowds gathered outside event locations and on public transportation can be attractive targets for individuals and groups looking to carry out attacks, a concern touched upon by NYPD's head of Intelligence and Counterterrorism John Miller. "You're also looking in Boston Marathon example, where the potential for terrorist threat not against the protectee, but against the crowd," he said. "We have layers behind that."